Welcome to our Ischia blog, Good Morning Ischia! Here you can see the entry for Wednesday 25th December 2013. Or should I say "Merry Christmas Ischia!" Just the very briefest of blog entries this morning as there's lots of Christmassing to be done but I just wanted to wish you all a great day wherever you are. We've got beautiful weather here today and are expecting unseasonably high temperatures of 18° Celcius (64° fahrenheit) dropping no lower than 12°C (54°F) this evening. 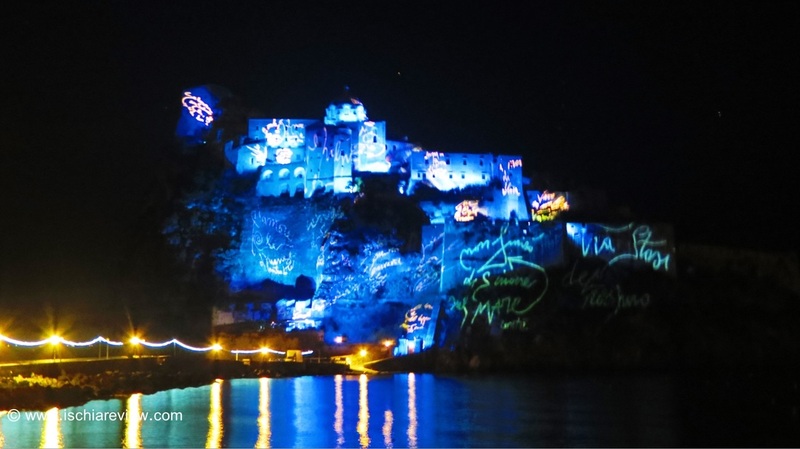 Today's photo is from Ischia Ponte where Castello Aragonese has had a Christmas makeover with its special light projection making it visible for miles around every evening. Ok that's all for today, and once again, Merry Christmas! Buon Natale and Tanti Auguri!! !